Deep thought have been involved in the manufacturing of these socks to ensure the best treatment to the diabetic foot. The advantages of silver have been long known throughout history, ever since the Romans used as an antiseptic material. Silver ions are integrated in the yarns of these socks, therefore they are highly effective:1. Elastic yarns knitted in a special 'More Pull' technology to reduce pressure on blood vessels. Knitted with combed cotton and with 'CoolMax' polyester yarns specially developed with sweet-management qualities. The insole of the socks is upholstered in a cozy towel, with high absorbency and softness. 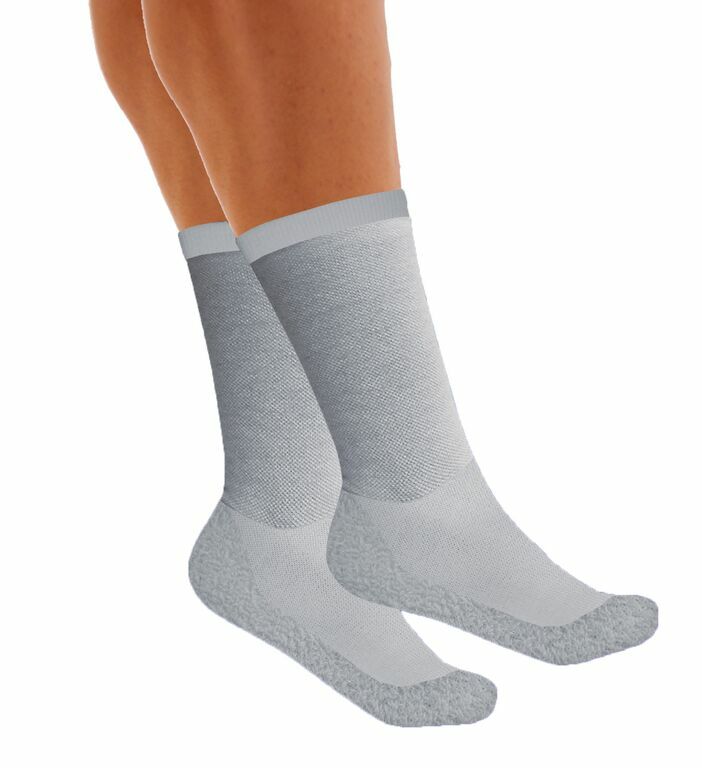 The socks are manufactured in advanced technology and seamless flat stitching in the toe area, to prevent rubbing and friction. * Antibacterial - preventing the formation of bacteria which leads to bad odor. * Prevent moisture and keep feet dry. * Sustainable quality and features after washing. * Thermo-dynamic- regulate foot temperature (cold in summer, warm in winter) and stimulate blood flow. Do not use the product if hypersensitive to any of its ingredients. Must be used only for the purpose for which it was intended. In case of worsening symptoms or appearance of new symptoms or if the pain does not pass, please contact your physician. Composition: 50% cotton, 22% CoolMax Silver, 25% polyamide, 3% Elastane.